It's reveal day at My Creative Scrapbook. Yay! Now, I can post the things that I have been working on for the last few weeks. I worked with two kits this month and I am going to show you the Creative Kit today. 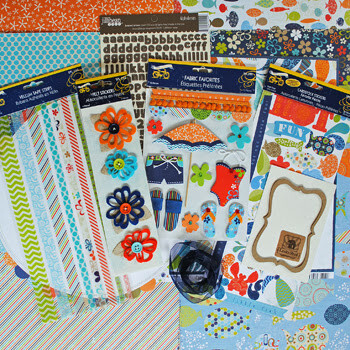 This kit featured Little Yellow Bicycle's Splash collection and it is a real favorite of mine. The timing was great for this kit because I got back from the beach on the same day the kit arrived, so I had lots of new photos that worked well with this collection. 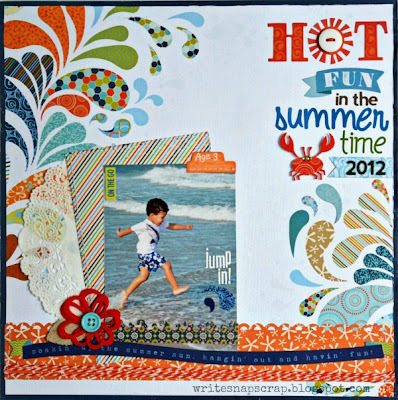 This is the first layout I made, Hot Fun in the Summertime. The title is from an old tune by Sly & The Family Stone and was also covered by The Beach Boys. I had this song running through my head the whole time I was making this page. The paper was originally oriented with the big splash on the bottom, but I rotated the page 90 degrees to give me a better spot for my titlework. And here's a closeup of the bottom of the page. I love this photo of my son, running to get in the ocean as soon as we got there! 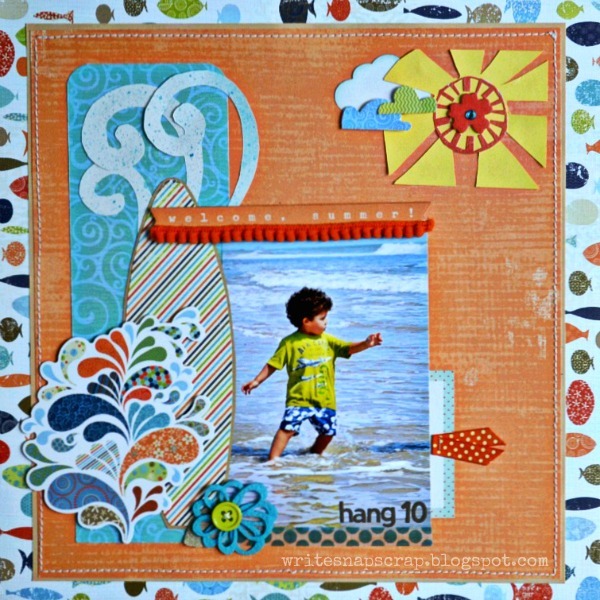 My second layout also uses a beach photo. Here, my son is waiting for the next wave and it looks like he's surfing. He's only 3, so he hasn't quite mastered surfing yet, but I went with that for this page. I love this little fishie paper that's in the background. Super cute! 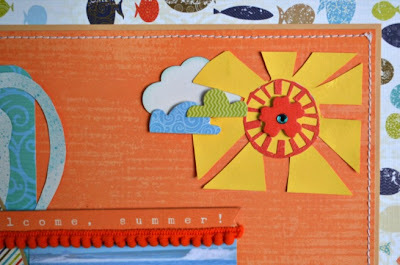 To make the sun, I used a small rectangle of cardstock and made cuts into it for a stylized sun. I used a sticker negative - from in the word HOT in the previous layout - as the the sun's center. Here's a closeup of the bottom of the layout. I made a surfboard from patterned paper, then pop-dotted a big splash sticker on top. Thanks so much for stopping by. 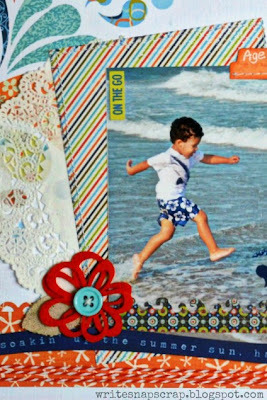 I'll have more projects from the kits at My Creative Scrapbook later this week. 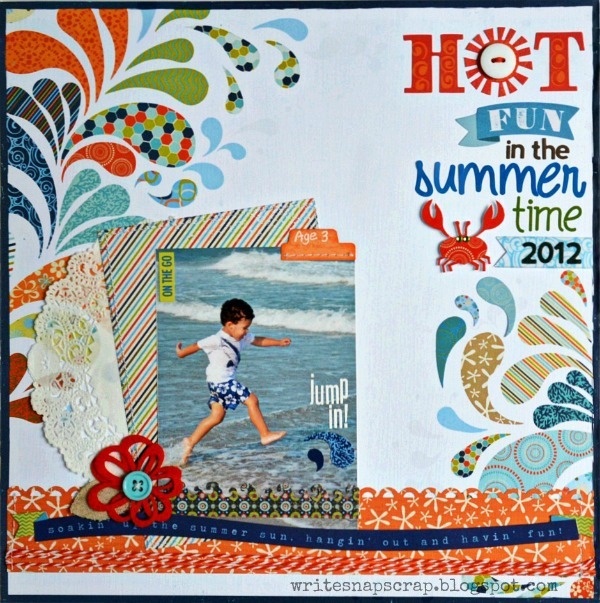 You can find out more about My Creative Scrapbook at the home page here. Wowwwwwwwwwwww! These are gorgeous! 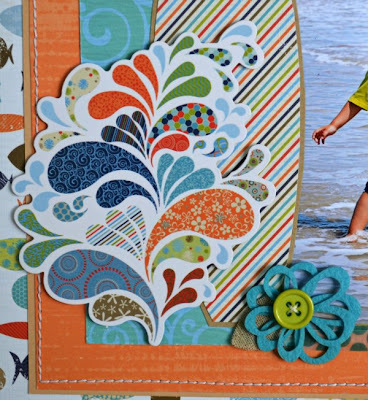 i loveeeeeeee the fun colors and love love love love all the wave splashes!!!! these are just amazing!! great job and wow that kit is awesome! both pages are super adorable! I love these! I think the 'Hot Fun' one might be my all-time favorite Izzy layout - which is really saying something!! I love all the smoking hot colours! Great job as always Izzy. Super layouts Izzy....love these patterned papers!! Great photo's of your son too and love all your cute accents! 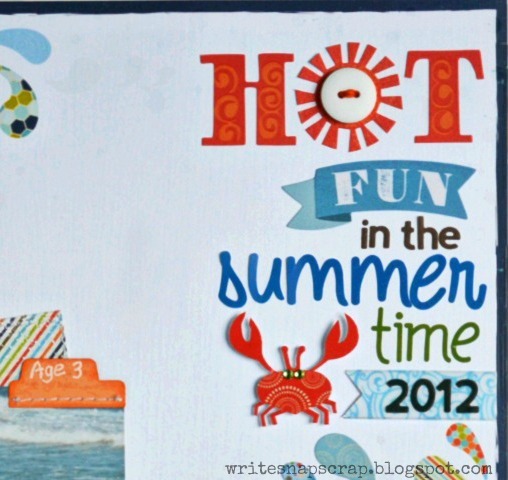 Love these summer pages!! Gorgeous pages to go with Ur gorgeous pics! So stinking cute, Izzy! Your son is just adorable. Those photos had to be scrapped. That collection is so colorful and fun! Love how you used it. So much detail! Super cute and fun layouts! Your son is so cute and looks like he was having a ball! Love the title work on your first layout and the layering on the second! I so love those papers, CUTE layouts. Such great layouts! Love all the details - the button for the O, the flowers, the mix of alphas, just great!